Midland is a community that is rich in history, culture and heritage. It is also home to Sainte-Marie among the Hurons-Ontario’s first European Community, which was the headquarters for the French Jesuit Mission to the Huron Wendat people. Midland boasts the Marty’s Shrine that honours the eight Jesuit saints who lived, worked and died there 380 years ago. With both large and small companies located in Midland, the community is full of professional and skilled trade workers. Midland has a vibrant and bustling downtown core consisting of 180 stores. 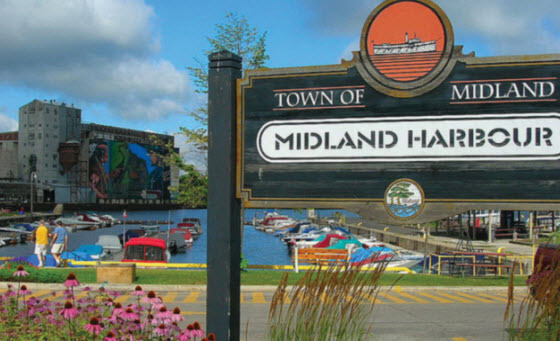 Truly living up to its motto “In Pursuit of Quality of Life”, Midland is a four-season community with an abundance of recreational pursuits as well as tremendous walking and cycling trails along its waterfront. It also has an inland lake and park, hiking and biking opportunities, golf and some of the best boating and fishing in the world. Georgian Bay General Hospital operates sites in Midland and Penetanguishene. Approximately 625 staff work between the two hospitals, with two-thirds employed at the Midland site. The North Simcoe Family Health Team is adjacent to the hospital and is serviced by 17 family physicians, nurse practitioners, social workers, registered nurses and a dietician. The Chigamik Community Health Centre (Chigamik is an Ojibwe word meaning The People’s Place) provides accessible health care in both official languages. Three family physicians and other health professionals serve the area.